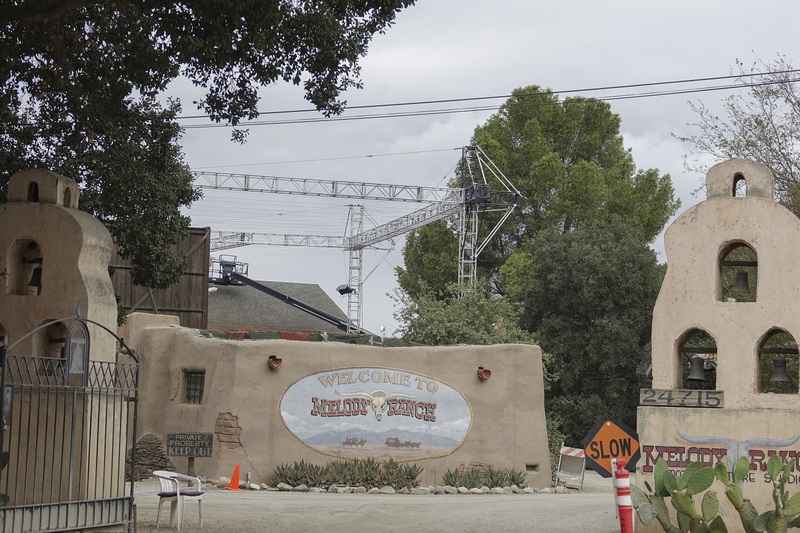 Earlier this month, Westworld Watchers reader Jeanne reported on some additions to the Melody Ranch site. 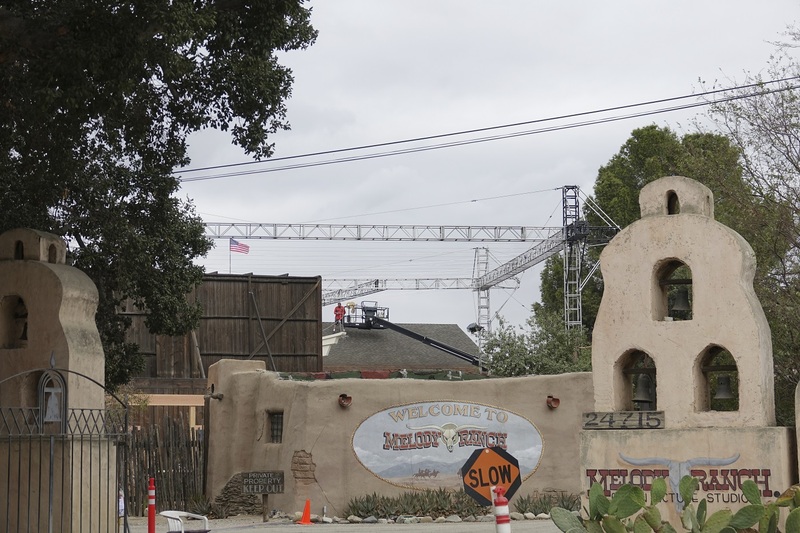 Metal scaffolding and raised walkways have been constructed, as well as a new building on the exterior town set. 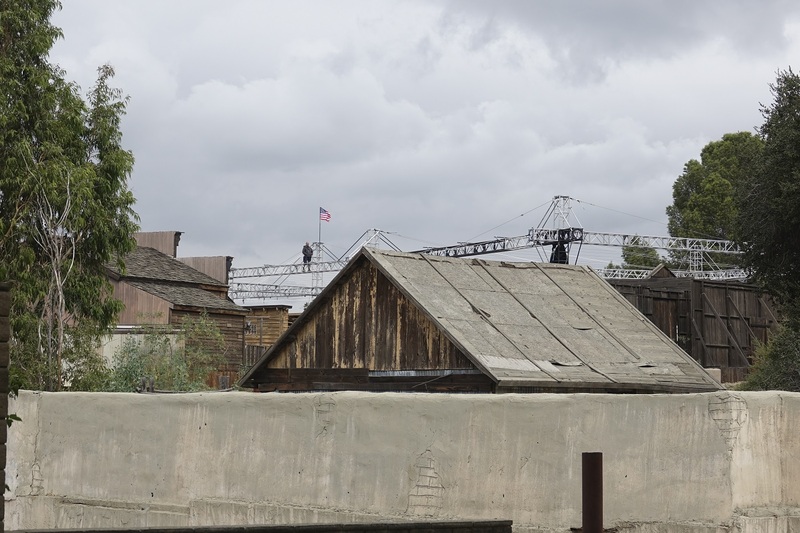 As filming continues, Jeanne has sent us some pictures of the set – one of which has spoilery implications for Westworld‘s second season. More photos below the cut! You can clearly see the metal framework in place, although it’s purpose is unclear. Is it used for overhead shots of the town, or for crew to easily move from one place to another? 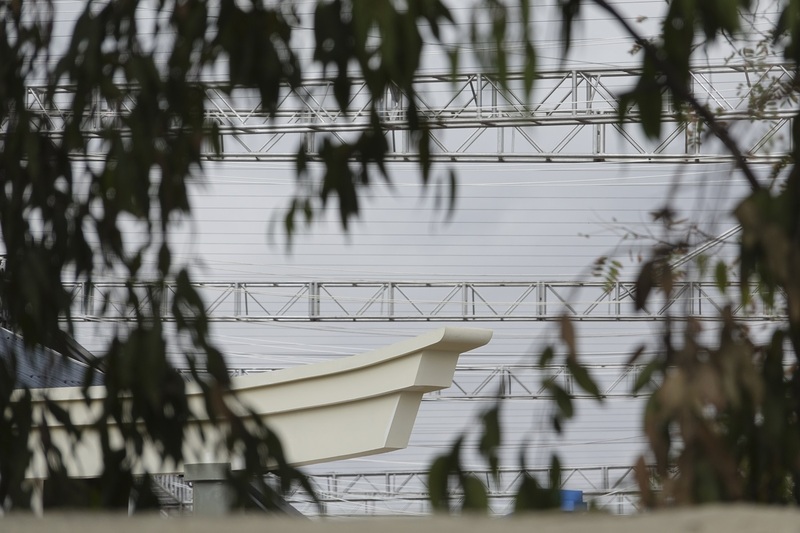 A crew member can be seen standing on one of the overhead walkways in several of the photos. The most interesting picture of the bunch can be seen below. It appears to contain a Japanese-style structure, which is a bit out of place in a Western town. Is this another clue that we will be seeing more of Samurai World in season two? It’s hard to imagine any other reason for this building to be on set. Let us know in the comments if you spot anything else of interest! I think this, and the stories about the casting of Japanese actors, strongly imply that “Samuraiworld” (or whatever it’s actually called) is going to have a part to play in S2. 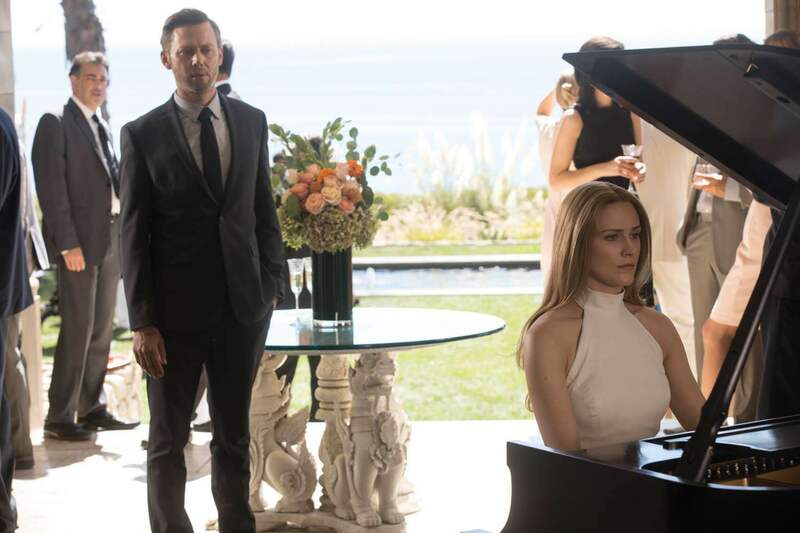 Maybe the host uprising spreads from Westworld to some of Delos’s other destinations? The SDCC-exclusive Funko of “Musashi” (which is apparently the name of the character one of the recently cast actors is meant to be playing) seems, with hindsight, like a playful “spoiler” dropped for the fans. hmm, it looks like the top part of a Japanese torii gate. That piece of archway (?) has been painted red, with a dark color ( black I think) on the top. They’ve hung a long roll of white fabric (?) 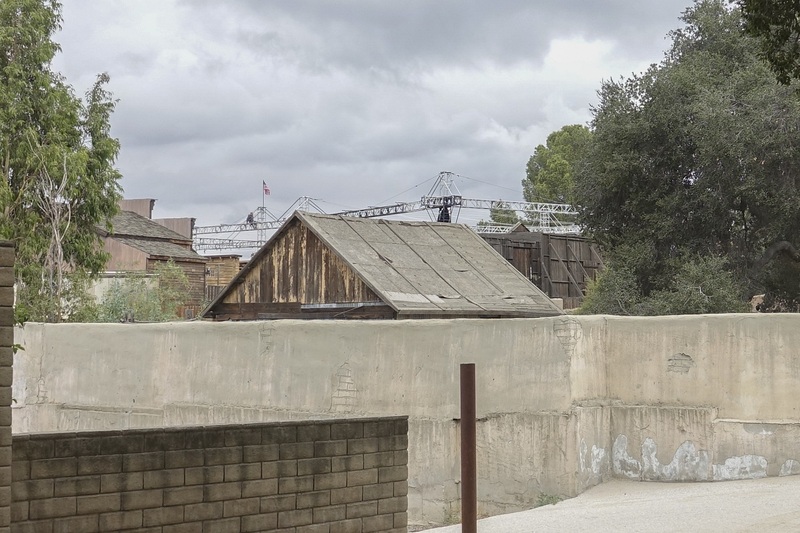 from the line of metal framework behind that spot – you can see the tip of that archway in the second pic. Don’t you think that framework is too elaborate to not be a part of the set? For instance, I saw them use a crane to hold two large lights to light a scene. 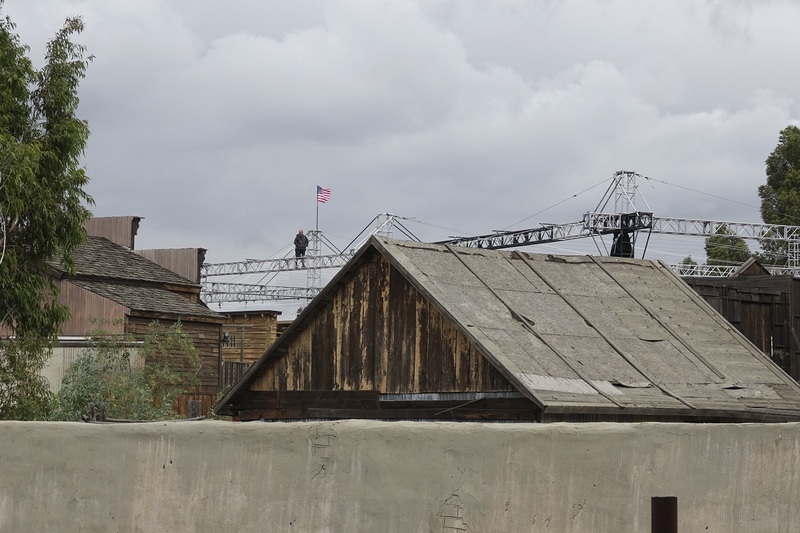 So if they have a crane (and cherry pickers) why would they need to build a structure that large (it’s actually four squares long) to film or light from? And the crew could travel faster on the ground. Why did they put an American flag on top of the structure? You make a good point about the metal framework – it seems like an awful lot of work (and now dressing) is going into it. If possible, do you think you’d be able to snap some pics of the newly-painted archway and the dressing being set up on the metal framework? We’d love to see how they’re continuing to build it out! Ddslumber was right. I got a better look this morning and it is a red Torii gate. They have the large cherry picker out and are working on the metal framework now. 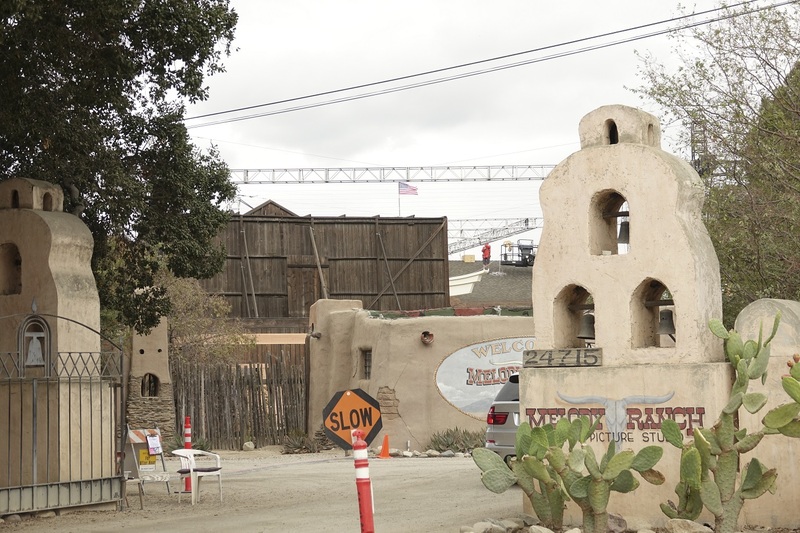 They have been filming in the western town the past two weeks. This week includes gunfire during the film shootings – one daytime shooting and three overnight shootings. I don’t know if they are filming yet on this first overnight film shoot. Lighting is in the form of large banks of lights held up by two very tall cherry pickers (I mistakenly called them cranes earlier) that sit at different ends of the scene. The light hits the metal framework as well so maybe it will included in the shots? Thanks for checking! Torii gate in a western town is very interesting. I wonder how it got there. Normally these gates are fixed to the ground and cannot be moved around (I’m from Japan). The Torii gate was built recently and was not placed in the western town. It is off to the side and is part of a new set which may portray the Samurai World section of the park. These walkways look a lot like wirework / Flying rigs done on a BIG scale. That would tie in with Eastworld….. Right now there is light-colored (white?) fabric hung from the walkways. It stretches from walkway to walkway, covering the areas within the framework (like shade cloth). The framework goes back for four squares and the fabric covers all of it. It’s not completely taut and is billowing gently in the wind. On another note, there was another small wildfire near the Ranch. It came within a mile and was put out with water drops and firefighters. There was a larger wildfire in the area earlier in the year. That one came as close as a little over a mile away. In Southern California we have earthquakes and wildfires. don’t make money on your site. I know one simple method of earning money, I think you will like it.